The kids headed back to school today. 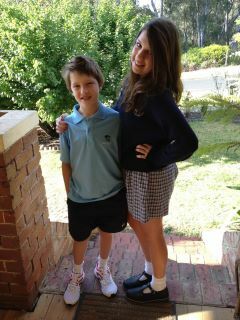 I mistakenly thought my son was supposed to start yesterday - the real first day of term. My husband went to all the trouble to get him and his lunch and breakie ready. Then he drove right past the school. My son called out: 'Why aren't you stopping Dad?!" He replied: 'Because there's 500 people missing from the school ground!' Back home they went. Today, my son didn't even make it into the school building before he hurt himself by falling and badly skinning his knee. He still went to Little Athletics in the evening, but it would have been sore to run and jump.